HOME Affairs Minister Peter Dutton has pleaded with Australians to help close a "black spot" in the country's ability to detect terror threats in the wake of the Bourke Street attack. "There is a real black spot for us, and that is a vulnerabilty," Mr Dutton admitted today, citing comments from Duncan Lewis, the Director-General of Security at ASIO, who said potential terrorists were using encrypted apps so their messages couldn't be discovered. "It is even more difficult today than it was five or ten years ago to try to deal with some of these cases," Mr Dutton said. "The police can't contemplate every circumstance. "Where you have someone who is buying chemicals, importing or purchasing online different items that might be precursors to make up an explosive device, you would expect there to be intelligence around that activity. "Where you have someone who picks up a kitchen knife and grabs a couple of gas bottles and drives into the CBD, these are very difficult circumstances to stop." 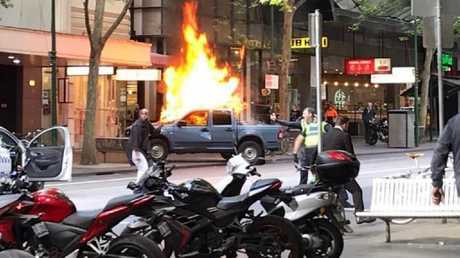 On Friday afternoon, 30-year-old Hassan Khalif Shire Ali pulled up in Bourke Street in a four-wheel drive, containing gas cylinders turned to their open position, in what police said was a failed plan to cause an explosion. The Somalia-born Ali then stabbed three men, including the popular 74-year-old Italian restaurateur Sisto Malaspina, who died at the scene. The two other victims are now recovering in Royal Melbourne Hospital. Police had no proof Ali was planning an attack beforehand. Mr Dutton did not reveal why Ali's passport was revoked in 2015, saying only that he had been spoken to by ASIO and other agencies and there was "no evidence" an attack was imminent. "The judgement made about this individual was that he was not in the planning stage of the attack," he said. The Home Affairs Minister indicated it was critical for Australians to report suspicious activity, to help authorities compensate for the "black spot". "Unless there's advice, as I say, from a community member or from a family member, or there's advice as the result of a surveillance process or intercept of a telecommunications device, then it is very, very difficult," Mr Dutton said. "My plea is to people within particularly the Islamic community, but across society. If you have information, if you see a behaviour of an individual or family member, someone in a workplace, that causes you concern, provide that information. "It may lead to somebody not going to Bourke Street Mall or not committing an offence that results in loss of life. "There may be no phone call. There may be no advice or planning or purchasing of particular precursors to make an improvised explosive device. So again, we need to be realistic about this. "That is why it is important for us to get as much information from the imams, from spouses, from family members, community members, council workers, people that might be interacting with those that might have changed their behaviours." We are gradually learning more about the troubled life of the Bourke Street terror attacker, Hassan Khalif Shire Ali. The Age reports Ali had grown increasingly "delusional" in the weeks before his deadly rampage in Melbourne. Isse Musse, an imam and friend of Ali's family, has told the newspaper Ali was "complaining he was being chased by unseen people with spears". Another source said his life had "spun out of control" as he dealt with mental health and substance abuse problems. Ali had been kicked out of the family home several times. Less than a week before the attack he was seen "storming out" of the property and appeared "agitated". The Sunday Herald Sun reports he had recently split from his wife. 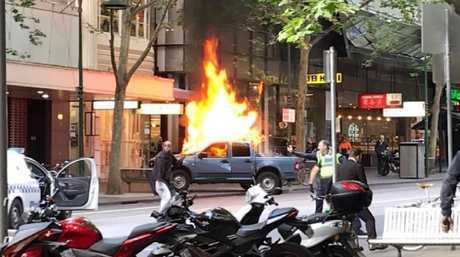 On Friday afternoon, the 30-year-old Ali pulled up in Bourke Street in his four-wheel drive containing gas cylinders turned to their open position, in what police said was a failed plan to cause an explosion. During the attack, police and civilians tried to subdue Ali before a new police member, only three months out of the academy, shot him in the chest. Ali died in hospital. Chief Commissioner Graham Ashton was full of praise for the officer, as well as another junior policeman who was on the scene. "These members found themselves in a dangerous situation very quickly," Mr Ashton said. "They acted very bravely. They endeavoured to do their job and they did that pretty effectively and bravely. They followed their training really well (and) I'm proud of their efforts." Mr Ashton said police were trained to kill if they believed their life or a member of the public's life was at risk. "We don't train people to wound people with firearms," he said. He said the two junior officers were "in good spirits although shaken up". Australian Federal Police acting Deputy Commissioner Ian McCartney told reporters on Saturday that Ali was known to have held radical views and that his passport was cancelled in 2015. The man confronts police in Bourke St this afternoon. Source: Chris Macheras. Premier Daniel Andrews said he had been briefed by police and intelligence agencies, including ASIO. "No history of violent offending, and I wouldn't go any further than that." Mr Andrews said he had not received any advice that security measures in Bourke Street and surrounds needed to be boosted. 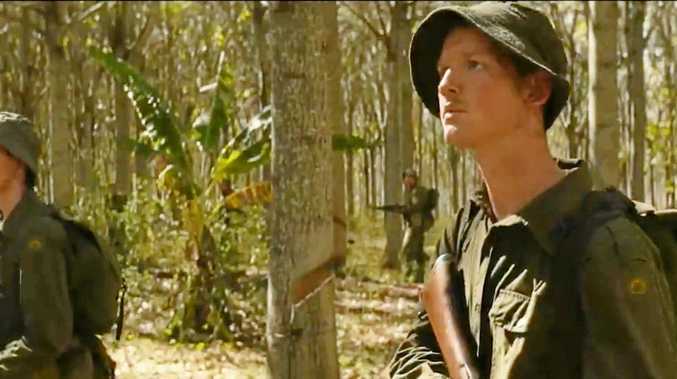 Prime Minister Scott Morrison said Ali had violated the nation's trust. Nino Pangrazio and his partner Sisto Malaspina. The Herald Sun reports a former nurse performed CPR on Mr Malaspina at the scene in a desperate attempt to save his life. But he had lost too much blood through his stab wound. "I know I did everything I could to try and save this poor man," she said. "I had to wipe the blood off his brow. I needed to give him that dignity because his face was so kind." The woman told him: "I'm so sorry. I'm so sorry. At least you are now at peace." 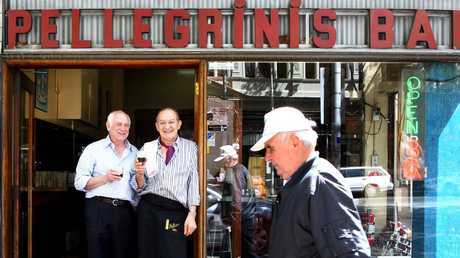 Staff at Pellegrini's Espresso Bar, a well-known cafe Mr Malaspina had owned for over 40 years, have been in mourning since the incident. THE "trolley man" who was hailed a hero on social media for taking on a terrorist has revealed what happened during the deadly terror attack in Melbourne yesterday. The man attempted to help police officers stop the terrorist - who had already killed one person and injured another two - by rolling a shopping trolley in his path. He was one of two bystanders who stepped in as killer Hassan Khalif Shire Ali tried to claim more victims. "Trolley man" today spoke to 7 News, who didn't identify him, and told the network he believes he helped save lives by defending the city. The attacker, from Melbourne's northwestern suburbs, was soon shot in the chest by police, before he died in hospital last night. Prime Minister Scott Morrison said the Somali-born Bourke Street terrorist had violated the nation's trust - saying "the greatest threat of religious extremism in this country is the radical and dangerous ideology of extremist Islam". Mr Morrison said Somali-born killer Hassan Khalif Shire Ali was one of about 400 people on a national ASIO terror watch list. 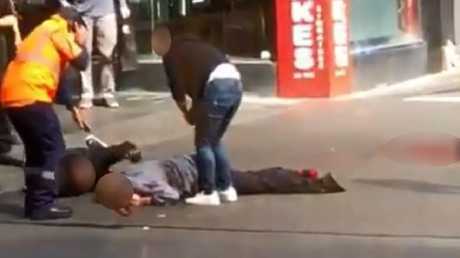 The Bourke Street knifeman was not actively monitored prior to his stabbing frenzy, despite the fact intelligence agencies cancelled his passport three years ago. In a press conference today, Victoria Police confirmed Somali-born killer Hassan Khalif Shire Ali had been known to intelligence agencies for years, but he was not being actively monitored prior to the attack. Despite this, Shire Ali was not kept under close watch. "He was never a target of the JCTT in terms of the investigations we undertook," said Commissioner Ian McCartney. "The assessment was made that while he had radicalised views he didn't pose a threat to the national security environment. He said the tragedy yesterday was a "reality check". "Even with the fall of the caliphate in the conflict zone, the threat continues to be real," the commissioner said. "But this is a complex and challenging business." Officers did note that, when a person's passport is cancelled due to being a potential terror risk, there are "ongoing daily, weekly and monthly reviews" in relation to the individual. But the commissioner repeatedly stressed that when ASIO cancelled Shire Ali's passport in 2015, the attacker "was not a threat at that time". On Saturday afternoon, the Herald Sun revealed incredible new footage of the moment police were forced to shoot Ali. Car horns are blaring and people can be heard yelling "shoot him" as the officers back away from the knife-wielding man. 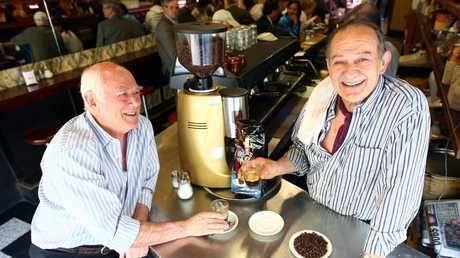 Melbourne coffee icon Sisto Malaspina has been identified as the murdered victim in Bourke Street's terror attack yesterday. Police are expected to confirm his identity later this afternoon. "Pellegrini's was the number one in the way it did things, the way things should be done - fresh ingredients, taken from the growers to the market to the shop. Everything done by hand. No mechanisation, no additives. Everything was simple, fresh and beautifully put together," Malaspina told Hospitality Magazine last year. Police have surrounded a house linked to Hassan Khalif Shire Ali, the man behind yesterday's Melbourne terror attack. Officers have been standing guard at the Werribee home since around 8am this morning, The Herald Sun reports. It's understood the attacker's family are inside the house and are co-operating with police. 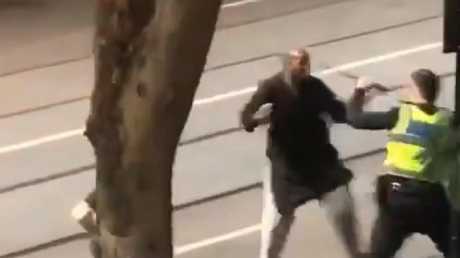 VICTORIA Police have identified the Bourke Street knifeman as Mohamed Khalif. The 31-year-old Somali-born attacker, from Melbourne's northwestern suburbs, died in hospital last night after being shot in the chest by police. Police Commissioner Graham Ashton said Khalif was known to counter-terrorism authorities, both "at the national level" and to the state police. "We're certainly confident it was a terrorist attack and that's the way we've been treating it overnight," he told The Today Show this morning. "He's pulled up in a car with gas cylinders. It looks like he's attempted to ignite a fire in the car... we believe with a view to ignite these canisters with some kind of explosion, but that didn't eventuate. He said Khalif has a prior criminal history in relation to driving offences, theft and previous cannabis use. Mr Ashton said the knifeman was not being actively monitored prior to the attack. He also confirmed police had spoken with the knifeman's wife, in contrast to previous reports that she had gone missing. "We know where his wife is and we have spoken with his wife, and she is not missing," he confirmed. Police said there has been nothing so far to suggest this attack was inspired by the James Gargasoulas attack on Bourke Street Mall last January. Asked about the broader issue of radicalisation in Melbourne, Mr Ashton said people need to be vigilant. "It's like all other big cities in the western world," he said. "You have to be alert for this sort of thing, and we have a lot of police working in counter-terrorism these days, and obviously at the national level with our federal agencies. "These are the types of attacks that are unfortunately all too common in big cities around the world and we've been no exception to that. "These days attacks can occur very quickly and can have very fatal consequences." 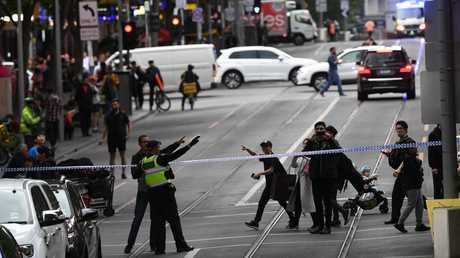 Bourke Street reopened around 6.15am this morning as investigators finished assessing the scene of the deadly terror attack. 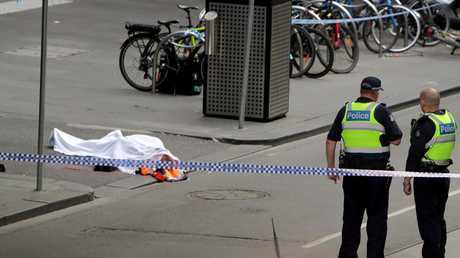 The Melbourne road had been shut off from Swanston St to Russell St as forensics and bomb experts examined the area, after a man went on a deadly stabbing frenzy yesterday afternoon. Three people were stabbed in the attack, with one victim dying at the scene. THE Islamic State terror group says one of its fighters carried out a knife attack in Melbourne yesterday in which one man died and two were wounded. "The one who executed the ramming and stabbing operation in Melbourne (..) is one of the fighters of the Islamic State and he executed the operation in response to (a call) to target the citizens of the coalition," Amaq said overnight. The text was referring to a call in August by Islamic State leader Abu Bakr al-Baghdadi to "use bombs, knives or cars to carry out attacks" in countries taking part in the US-led coalition that put an end to the caliphate he declared in 2014 over parts of Iraq and Syria. The knifeman, a 31-year-old Somali-born from Melbourne's north-western suburbs, died in hospital last night after being shot in the chest by police. In a press conference yesterday afternoon Victoria Police Chief Commissioner Graham Ashton said the man who is alleged to have stabbed three people, killing one, was known to Victoria Police and federal intelligence authorities. But The Herald Sun has named the attacker as Mohamed Khalif, who also reportedly goes by the name Hassan Shire. Bourke St is in lockdown from Swanston St to Russell St and is expected to remain closed until as late as 8am this morning as police investigate. 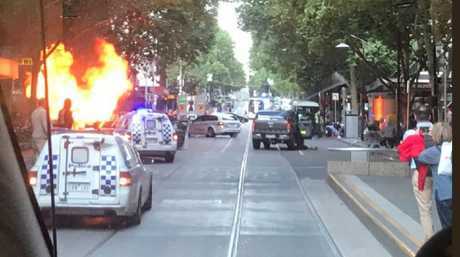 Footage on social media shows a blue ute in flames and a man dressed in a black tunic and white pants menacing police with a knife. 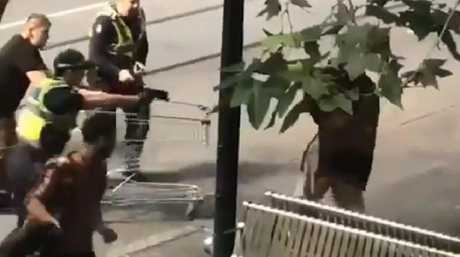 Two bystanders try to help officers stop the man, one of them by rolling a shopping trolley in his path. In an earlier press conference, Victoria Police Superintendent David Clayton told reporters that police were called to the scene after reports of a car on fire. When officers got out of the car, they were confronted by a male brandishing a knife and threatening them. Ambulance Victoria said it had assessed three people at the scene, who were then taken to hospital. If you or anyone you know needs help phone Lifeline 13 11 14 or beyondblue on 1300 22 4636.